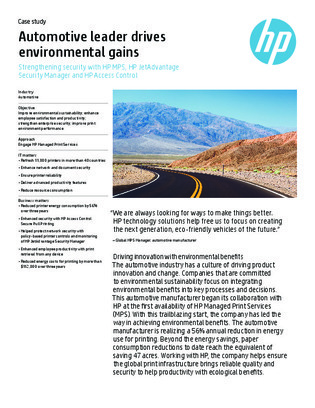 An automotive leader committed to environmental sustainability, was looking for a way to improve their print environment performance while reducing energy and resource consumption. Download this case study to learn how managed print services were the key to helping them achieve their goals. Inside, find out how they were able to realize a 56% annual reduction in energy use for printing, and paper reductions equivalent to saving 47 acres.